Why yes, it is nice here in my little world, thanks. fantasy artist and full-time geek. I am very bad at keeping this updated. It would be a bit ridiculous to try to recap all the time since my last post, so I'll stick with the photography-and-arts themed stuff. Magic Wings Butterfly Conservatory and the Butterflies exhibit at the Academy of Natural Sciences in Philadelphia are both awesome. Magic Wings also has wandering leaves and stick insects, making it even more awesome. So does the Academy of Natural Sciences, but they're not presently out on display - the keeper was nice enough to point them out to me (in terrariums just sorta visible in the back room), but they were not close enough for photography, sadly. I was able to get some really nice pictures of the ones at Magic Wings, and I've gotten some good butterfly shots at the Academy. I've also ventured back into painting, recently, and discovered that I've missed it. I want to do more painting. 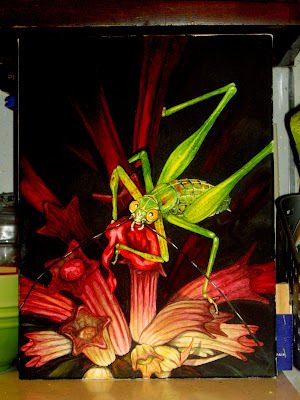 Bush Katydid nymph on Bee Balm flower, watercolor on canvas, 12"x16". The reds aren't really quite as neon-road-marking-paint bright as they look here, and the buds toward the bottom are more green, but this was the best I could do photographing it in indoor light, and it's windy outside. Long time no post, I know. I have been surviving that cold icky time that doesn't really need to exist winter. I did get to the insectarium, finally, and was rather disappointed. I really have nothing else to say about it that wouldn't turn into a rant. I also went to visit my friend Mihan in Mississippi, and was not disappointed - had an awesome time and gained . . I think I can blame 5lbs on her. The other 5lbs I think I need to blame on Christmas cookies. But, anyway, she is an amazing cook and generally an awesome person, and her offspring is adorable. See? Or, I may get to take some good pictures this weekend, at Magic Wings Butterfly Conservatory. I've been there once before, and the place is just awesome. And they have a few other exotic insects besides the butterflies; I want to spend more time trying to get good pictures of them, this time. I'll be up in Massachusetts visiting Heather and Gerbil (Gerbil, are you unilaterally opposed to the use of your real name online in a blog-like setting? I'm erring on the side of caution here), and their highly adorable offspring - lots of adorable little people around, lately. And on Sunday it will be my birthday - and also Gerbil's. As I recall, I am 17 hours and 57 minutes her elder. I must try to think of some deep elder wisdom to impart in that approximately 3/4 of a day. I find it kind of cool that my birthday is on the perihelion, and would not want to change that, but sometimes I do wish it fell not quite so close to the new year. It's sort of like being whacked in the head with the fact that time marches on, all at once - and time has not stinted on the marching this past year, in ways both good and bad. Plans for the new year presently involve visiting as many people as possible as many times as possible, but definitely E over in England and her adorable offspring, aka the honorary nephew. Also taking pictures of many bugs, possibly trying to sell said pictures, keeping on keeping on in the quest for a literary agent, writing that sequel (about 34 pages at present, I haven't checked a word count recently), and putting lots and lots of money in the bank so that hopefully at the beginning of 2010, I can be a home owner (hopefully of a home located somewhere that I won't get shot and/or eaten by a bear coming out my front door; my present budget gives me more or less those two options). Also I should probably promise to do some sit-ups and eat some fruit and wear sunscreen, or something like that, but really, everybody dies sometime - I'm more concerned with having a life while I'm here. So this is what I intend to do in 2009 - live lots, and hopefully not die. Cheers. Still haven't made it to the insectarium - was going to try to go yesterday, but got out of work late, and they close at 4, and I was wary of ending up in the same situation I was in last week, i.e. it's too close to closing and they won't let me in. Also this past week, despite being interrupted by the holiday, has been absolute unmitigated insanity at work, and I was pretty tired. Anyway, over the holiday break I made myself a photography website: http://www.toomanythoughts.net/photography.html I'm now working on adding species-specific galleries (fork-tailed bush katydids still have more fun). . . I do not have more fun, right now, because it's 34 degrees out and I had to kick a wolf spider outside this morning (if it were me, I strongly suspect I'd just throw it into the terrarium until we hit a warm day, but I think this would not amuse the housemates - especially as the terrarium is open-topped and it could decide to venture out exploring again if it wanted). So I tossed it into an area with lots of decomposing leaves, which should provide it warmth, but still, poor spider. I do not like winter. I do not like winter at all. (Why do I feel like I'm reading from some sort of seasonal-affective-disorder parody of 'Green Eggs and Ham'?) I really, really wish I could go outside and take pictures, but sadly, see above re: raining, 34 degrees, lack of bugs (except the poor spider). I did find a boxelder bug (or possibly a large milkwood bug - I have difficulty telling them apart) drinking from the cat's water dish the other day, and that I did throw into the little greenhouse shelf in the kitchen . . and it did decide to venture out again, because I can find neither it nor its spiderwebby corpse (as there was apparently a wolf spider around) anywhere near the greenhouse shelf. Oh well. I did take its picture. Which I could show you if my computer were recognizing my SD card. Which it's not. Because life hates me. Okay, okay, /pity party. 111 days until spring. I attempted to go to the Philadelphia Insectarium today. The gift shop / ticket counter shares space with an exterminator's office. I have the distinct impression I'm being laughed at in some abstracted sort of way, by way of this arrangement. Oh well. Anyway, I managed to drive past it about three times before I actually figured out a.) what building it was, and b.) where I could park (streetside parking was prohibited by special police order today, for no apparent reason that I could discern). This resulted in it being about 20 minutes to closing when I finally got there, and the nice older man working the desk at the gift shop / exterminator's office / ticket counter (who looked downright shocked to see a person walk in his door) wouldn't let me in. He was pleasant and polite and gave me a free admission pass for next time, though, so it's all good. I do intend to go back and be mocked by the whole set-up some other day, because they apparently have bugs that look like leaves and preying mantises from India with purple eyes. I also emailed these people: Minden Pictures - to ask the proper procedure for submitting a portfolio. I don't seriously expect anything to come of this, but hey, it's worth a try. This past month has been full of re-writes and sewing projects; while I haven't heard back from the various folks who have the re-written novel bits just yet, I'm fairly confident in them. They probably need polishing, as first drafts of anything usually do, even random bits of new in the middle of lots of has-been-edited-80-times, but I think they make the book better overall. I now have vampires that don't feel so tacked on, further illustration of Darren's abilities and what exactly the vow of Wardenship does, and a tiny little bit of character development for the vampire formly known as Claudia - I've re-named her. She's Lydia now (just as of today, actually, so that'll be news even to the people who have the re-writes). And all of the above, when combined, make this fictional supernatural world that I'm building a little bit more ominous - which is good. So generally, I feel accomplished about this. In the way of sewing, my most ambitious project was a winter coat. It's finished, sort of, but I'm not entirely satisfied with it. I wanted it to close in the front with these pretty pewter-looking clasps, but after a few weeks of use, I'm not sure I'm sold on their practicality. I sort of want a zipper, just for convenience. But a zipper would just look so much less cool. I'm still waffling on this. It'd be easy enough to go back and put in a zipper instead, but it'd make the coat not nearly as nifty. Also, the cuffs are huge. This is owing in large part to the sewing machine on which the coat was made - the cuffs, to get sewn, had to be able to fit around the . . . part of the machine where the bobbin goes? I'm unsure of its official name, but it's significantly wider than my wrist. I'm debating on ways to fix this still. So the coat is in use, but it's not really quite finished, so I'm not posting any pictures just yet. I'll post pictures when I have a truly final version of the coat to photograph. Also, I've been making skirts from curtains. This is an idea that had occurred to me some time ago, but at the time, I'd been thinking mostly of buying fancy curtains and making fancy dresses, and I have a number of fancy dresses already and very few occasions for wearing them, so this possibility was never explored. Last week, though, I was in the Linens & Things (which is closing down - the entire chain, apparently) buying some flannel sheets, when I saw a very pretty one-panel curtain package, in a floral pattern, at a very clearance-like price, and thought, hrmm . . . that'd make a pretty skirt. And it did make a pretty skirt, and I was so amused by the idea of having all the many truly nifty fabrics used for curtains available to me for much, much cheaper than the home decor fabrics are sold at the fabric store ($20/yard and up, mostly - a bit out of my budget), that I went out and bought two more on-sale curtains. The one was a really gorgeous red silk that was so cheap I figured it was worth getting even if I don't have a particular use for a red silk dress at the moment - something will come up eventually, and I'll never see red silk for roughly $3/yard again in my life, I'm sure. The other was a sort of jacquard chenille tapestry-ish thingie, which I though would make a nice winter-weight skirt. It did. It is October 28th here; on the waning side of fall, but still firmly within the realm of autumn, and not winter. So somebody please explain to me why in the heck we had four inches of snow yesterday. There was a wolf spider in my work yesterday, which I had to put outside. I felt really bad. I dug it a little hole down into the mulch where hopefully the heat of decomposition will keep it non-frozen, but still, poor spider. Today I am finishing up sewing clasps on my winter coat (which I would have liked to have had yesterday, though at least I wore the old one, and not my fall jacket), doing re-writes on the first novel, and waiting to find out if I'm going to be going in to work this afternoon. I'm supposed to be filling in for a coworker, but as of last night, the appointment schedule looked so sparse that they may decide they don't need me. Re-writes are a little unnerving; I think I am improving the book (it has vampires who actually exist, in a not-tacked-on-as-an-afterthought sort of way, now), but my wordcount has jumped significantly. It's not yet over 100k, but it's nearing it. 100k is generally the upper end of what's acceptable for genre fiction, unless the genre is sword-and-sorcery type high fantasy, which this isn't. (Though it does contain both a sword and an individual capable of magic.) I suppose once I get done adding in stuff that should have been there, I'll have to go back and see if there's anything that shouldn't be there. I'm an aspiring urban fantasy author, currently in the process of seeking representation for my first novel. I'm also a fantasy artist and an amateur nature photographer. I take pictures of bugs; it's more interesting than it sounds, really. I live for the summer; during that part of the year when most (sane) people are huddled somewhere air-conditioned, you'll most likely find me contorted under a bush, trying to get my little digital camera to focus on something small, strange, and many-legged. I also sew, garden, invent recipes that periodically even result in edible food, and spend far, far too much time on the computer, either reading or writing.